Welcome! Your conference bridge is ready to use. You and your guests will dial-in to the toll-free number at the time you designate (usually people confirm the time via email with everyone.) The conference bridge is open to you 24/7 and you do not need reservations. Just set up your conference call whenever you want. When everyone dials in, the automated system will answer and prompt everyone to enter their passcode, followed by the pound or hashtag sign (#). You should enter your Host code, and your guests should enter the Guest code. Music on Hold: Your guests will listen to music until you as the host enters the conference. Entry and Exit Beeps: When you hear a single beep, someone has entered your conference. When you hear a double beep, someone has left your conference. Auto Hang-Up: When you as the host hangs up, everyone will be disconnected. (These are optional services and you if want to. Recording instructions of you have the Instant Activation Toll Free Service: When you are on your conference call, you can start recording your conference by *2. You can do the same to stop recording. To retrieve or download a recording, you can go to this website http://recordingrequest.com and fill out the request form and we will send it to you. If you have any questions or need help, just call us at 888-239-3969. 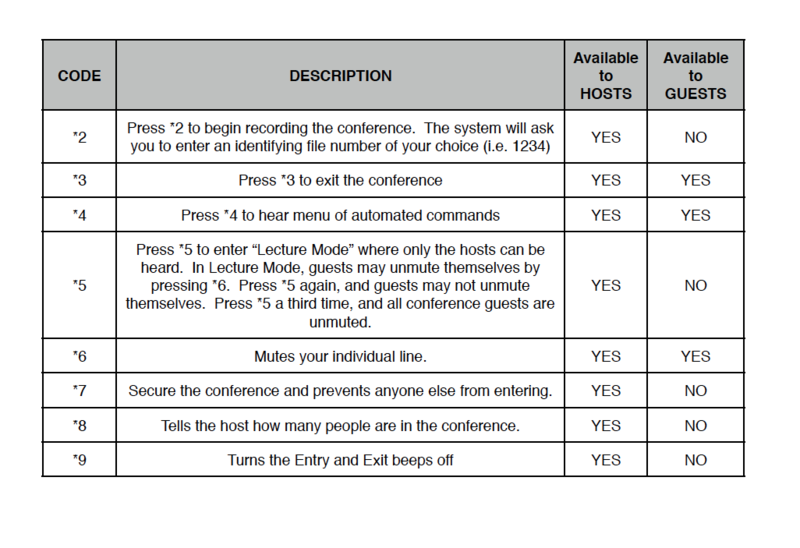 The table below shows the telephone codes that hosts and guests can use during a conference to issue various commands.